I file this under, "A book I'd love to say I've read, but probably never will!" lol!! Started it & couldn't finish. I was trying to find a piece to use with the Industrial Revolution. If I ever switch to being an English teacher, I think it might be a good classic literature link for a unit on zombies. A classic I've yet to read, but must remedy! Such a good rainy day read! I really wanted to like this, and parts of it I did. But half of the story was Victor Frankenstein rambling about his exotic travels. The parts with the monster seemed weak and anticlimactic. How ironic that I checked your blog today. I really liked Frankenstein too, but I thought I would like it more than I did. Some parts were a bit too philosophical for me, but I also found it fascinating and filled with this underlying dread. I love seeing reviews of the classics. We sometimes get so caught up with new releases, that forget to come back to stuff that's been around the block for years! Now, on Frankenstein. I've not read it yet. 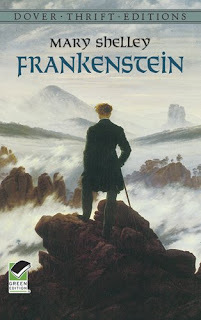 I did read Dracula, which if I remember correctly was born from the same bet, and did read Whutering Heights, which is another gothic must-read... And somehow, Frankenstein always got pushed to the second row! I do want to read it, though, because I love the contrast between today's gothic lit and early gothic - it has changed so much! Ashley - LOL. I know what you mean, girl. Amy - I never had an English teacher as cool as you. ;) A zombie unit would have rocked pretty hard. JEM - It was definitely the story that won me. Sothis Dhampir - Perhaps that's what allowed me to have a lot of sympathy for the monster. .alana. - No, it's actually only 273 pages. Even with the prose I found it to be a pretty quick read. Midnyte - It really was dreadful. ( < That didn't come out right.) There was a lot of death in Frankenstein. I may have been at an advantage expecting *not* to like it. Thanks, Ron. I loved Dracula. I went into Dracula expecting the writing to be difficult and was pleasantly surprised to find the writing to be easy to read and the atmosphere to be genuinely eerie. Unfortunately I can't say the same about Shelley's writing. At times it was as difficult to read as what I *expected* Dracula to be, but either the writing eased up toward the end, I got comfortable with the writing, or how much I was enjoying the story affected the writing because by the end it seemed a lot easier to read. I think you will enjoy it. I've never read Frankenstein and I've never really felt inclined to do so until recently. I always start to feel bad as a reader when people reference books in other literature or tv and I don't understand what they mean. I decided that I needed to read it and then this helpful review makes me actually look forward to reading it. One day I'd like to read this one. An occasional horror novel is so much better than a horror movie. My imagination is much more scary, LOL!